MARANELLO KART TEAM IS NOW COMPLETE AND READY FOR NEXT SEASON. THE STRONG AND SKILLFUL DE BRABANDER HAS JUST JOINED THE ITALIAN TEAM. IN 2013 WITH MARANELLO KART ALSO THE EXCELLENT ITALIAN DRIVERS MARCO ZANCHETTA AND MASSIMO DANTE, BESIDES THE DANISH ANDREAS HANSEN. Lonato del Garda (Brescia- Italy). 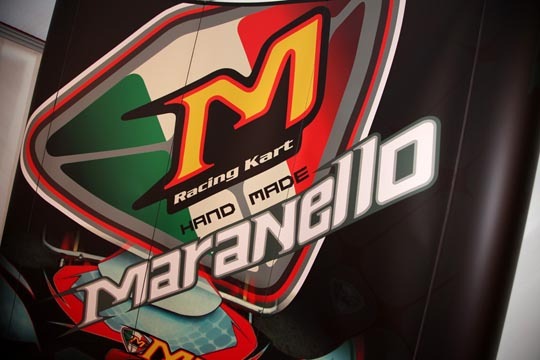 The new Maranello Kart drivers for 2013 have definitely joined the team, and they are all first rate drivers, ready to race for the Italian team in the forthcoming racing season. In 2013, the Belgian Yannick De Brabander is racing for Maranello Kart in the KZ1 category, together with the Italian Marco Zanchetta and Massimo Dante in KZ2 and the Danish Andreas at his debut in this category. The most outstanding driver of the pack is, doubtlessly, the Belgian Yannick De Brabander: he is so fast and so extremely competitive that he is regarded as one of the best kart talents ever. De Brabander has just achieved a streak of excellent results inthese last few years, culminating with the second place in the 2011 KZ1 world championship in Genk at the end of a legendary and unforgettable duel with Jonathan Thonon. For Yannick De Brabander, 22 years old from Boechout in Belgium, it is a comeback to Maranello Kart, after racing for the Italian constructor at the beginning of his career. The Belgian driver is going to make his debut with Maranello Kart in KZ2 in the forthcoming Winter Cup of Lonato on 17th February. Anyway, his main commitment is the KZ1 world championship and the KZ1 European championship, besides some appointments in the WSK Euro Series such as, this is sure, the round of Genk in Belgium. Besides De Brabander, also the strong Italian driver Marco Zanchetta, 2011 WSK Master Series champion, and Massimo Dante, 2010 Italian champion of the 125 Italia and runner-up in the 2012 KZ2 Italian championship, signed for Maranello kart for the KZ2 category. In KZ2 the participation for Maranello Kart of theDanish Andreas Sebastian Hansen has been confirmed with the team led by Wim Eyckmans, at his debut in gear-box category after the excellent achievements in KF2, such as the third place in the 2011 EuropeanChampionship. Another important novelty in 2013 for Maranello Kart is represented by the arrival of the new technical manager Stefano Griggio, the new responsible of the racing team and of the development of the chassis. Great satisfaction for Luca Iannaccone, Maranello Kart responsible, for the agreements concluded for next season: "I'm particularly satisfied for what I can expect from next season. Thanks to our new chassis, the RS7 and RS10, the arrival of excellent drivers such as De Brabander, Zanchetta and Dante, besides Hansen's confirmation and the presence of a worthy technician such as Stefano Griggio, we are ready to face the next international championships aiming at getting great results." in the meantime, in these days, Maranello Kart is at the international kart-exhibition of Offenbach in Germany with its production in the CRG Group pavillion.